electro-music.com :: View topic - CE-1 clone ? I may be interested, but I don't know what the CE-1 sounds like. Are there any samples that show off what it can do? Tonepad.com has CE-2 boards (probably pretty similar?) available for 17 USD. Perhaps it would be wise to add some more features instead of simply making a clone? Right; just cloning something 1:1 isn't that exciting. I want to make sure that it behaves like the original, though. I'll probably add a preamp (see above). And maybe a link function to allow two boards to work in dual-BBD / inverted modulation mode for true stereo? Various modulation shapes are always good, or external exponential CV inputs; then we can route and patch to our heart's content. If you want to get really snazzy, look into the concept of "crossover chorus" per Korg's digital FX. Only chorus the part of the signal above say 500Hz, and leave the rest alone. Stops the fundamental from swimming but leaves the shimmer. I received the BBDs from Smallbear; the amplifier chips are on their way. Finding the right transistors (replacement types) will be a big issue. aaah yes roland analog chorus... I've been loving this ever since my first synth ever: Juno-6. beep blurp flurrrp fiszzzzp pow bakka wakka wakka -A synth freaks mental notes. For this project you are planning to use the original MN3002 BBD, correct? After rereading this thread, I didn't find anything said to the contrary. I'm ready to do a buy at Small Bear and figured on grabbing a couple. And no worries, even in the (hopefully unlikely) event your CE-1 clone doesn't materialize, I won't mind having them on hand just in case of . . . a BBD emergency. For this project you are planning to use the original MN3002 BBD, correct? I was quite surprised to see them available still, with the CE-1 having such a mythological status, and apparently no one making a diy clone all these years. The BBD and amp chips? The unique noise reduction circuit? The brilliant one-knob chorus control? The independent chorus and vibrato settings? The heavy die-cast enclosure that symbolizes value? The total thing that is more than the sum of its parts? Whatever - I think with the original BBD chips available and enough information (and samples even) of the preamp chips, it'll be quite possible to make something that has the magic of the original. FWIW, as a guitarist mainly, my take on the CE-1 (during minor repairs on a friend's), was that the loading effects of the input section (high freq roll-off?) coupled with the near-direct path to the BBDs (2nd harmonic distortion?) made for a sort of crunchy dark character, easy on the ears over extended listening. Also, the rather lo-fi anomalies seem offset by the fact of the 15-volt supply, making it sound somehow "bigger" than the typical 9-volt stompbox chorus. How all these factors affect a line-level signal I never had a chance to try. I'm looking forward to your analysis of what really makes the thing tick. Whatever modern extras you include in your version, it'll be great to have the option of a "stock configuration," with all it's endearing quirks. I believe Richard Thompson used one in the 1980s, so his Shoot Out the Lights album has some great samples - and his ex wife Linda!! Electrolytic capacitor C42, a bit rightward of the output of IC3, is designated as .047uF. Doing some work on a friend's CE-1 (again), I noticed the actual PCB had a .47uF for C42. It seems to me the value on the PCB is correct and the schemo is wrong. My friend complained of a "whooshing" sound whenever he used a high-gain effect before of the CE-1. I explained the noise-gate and told him I would see if the decay time could be decreased. But I found that something like .1uF for C42 caused too-abrupt decay and chattering of the gate, and anything larger than .1 made little difference in the decay "hangover." I wound up leaving the stock value. Those guys at Boss had their $&!# together. I didn't know it yet, but I wouldn't have believed a 47nF cap to be an electrolytic, so I'd be going to ask sooner or later. Well, 2 months ago the doctors said I was in danger of that, but now they are taking care of my high blood pressure. The CE-1 clone project is not forgotten. 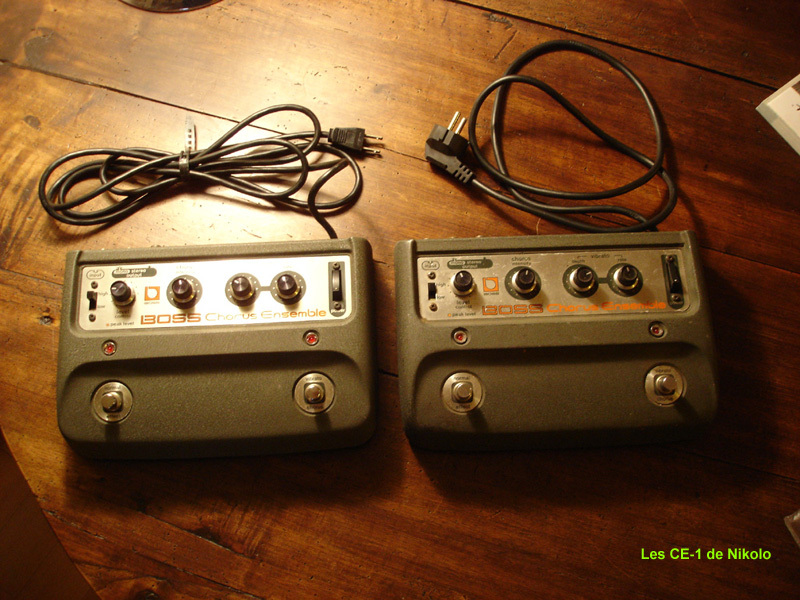 In fact Im found of theses pedals..
How about a board giving you the "best of" the Roland modulation boxes? CE-1, SDD-320, maybe one of the classic roland flangers/phasers? And, I think I've seen someone else is working on a Dim D cone PCB on some other forum. Forgot where Ive seen it, but you'll certainly find it. How about this: If no one offeres a convincing Dim D emulation (either as PCB, or as a finished FX) within the next 6 months, I'll go for it. Remind me if I forget. I remember the halcyon days when it was just the S-DIY list.... So many boards, so little time! It's one of those sounds that personally I'd like to keep in the analog realm instead of digital - there's a certain warmth to those circuits, provided one can keep the noise down! Thanks again for all your hard work and inspiration, JH!